What Kind Of Savings Account Should I Open? Many years ago opening a bank savings and/or checking account was easy. There were a few banks in your town from which to choose. Typically, you chose a bank close to home or work. You might have considered the freebie or the gift offered before opening the account. When opening an account in the pre-internet days you got a nice gift, maybe a toaster or some other household appliance, along with a few starter checks and a little book in which to record of all of your deposits. When you got a check or cash, you visited the bank and deposited the money into your savings or checking account. You paid bills by writing checks and mailing them to the merchant. Today, the banking decision is much more complicated, as evidenced by Justin’s question. There are many banks and financial entities clamoring for our business. But, not only is the banking decision more complex, the savings interest rates are so low that we don’t have the same motivation to explore the banking options because regardless of where we bank, our interest rate is still going to be deplorably low. Where to save my money? What Type of Bank Account Should I Open? Any of the above types of financial institutions offer checking and savings type accounts. If the above five choices weren’t enough, each banking institution offers many types of accounts. For example, for savings, you can invest in a money market fund, a high yield account, a low minimum savings account etc. and depending upon the account, you can expect different fees and interest rates. Where you have your account is less important than the details surrounding the type of account you choose. For example, if you bank at a bank, credit union, or discount investment broker, doesn’t matter much. But the type of account including fees and interest rates is important. 1. No monthly fee: Find an account with no monthly fee. 2. No ATM fee: Make sure you can cash conveniently without paying a fee. The institution either needs many branches or will refund ATM fees. 3. Free online bill pay: Don’t pay a fee to pay your bills. That makes no sense. Questions to Ask Yourself Before Opening An Account? What type of banking do I need? For example, we use our bank checking account for direct deposit of paychecks and paying bills. Our attached savings account keeps a nice cash cushion for emergencies. Our bank account is linked to our investment accounts for fund transfer as well as my business Paypal account. I hate to admit it but, we opened our bank account when we lived back east about 12 years ago and have not reevaluated since then. We moved and kept the account out of convenience, even though this particular bank has no branches near our home in California. I mail in deposits and have regular pay direct deposited into the account. You need to think about what you want or need out of your banking relationship. What Is the Purpose Of the Cash Portion Of Your Savings? 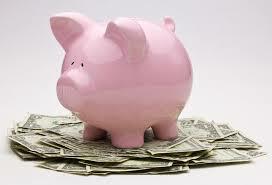 You need a large cash cushion for emergencies such as loss of a job, home and car repairs, and medical emergencies. The exact amount is a personal decision. I like to keep almost one years expenses in cash because it makes me feel secure. At a minimum, you need at least 6 months living expenses in a savings account. If you job is insecure or if you are a one income family, you need a greater cash cushion. Whether that savings is in a traditional bank, online, brokerage account bank is unimportant. Focus more on where you can get the highest interest rate on this cash. Justin mentioned that inflation kills the purchasing power of money sitting in a savings account. Justin was referring to the “real return” or the actual growth of your funds determined by the difference between the interest rate and the inflation rate. For example if inflation is 3% and your interest rate is 4%, then you are making approximately a 1% (4%-3%) real return above inflation on your savings. If inflation is 3% and your bank interest rate is 2%, then you are actually losing 1% (3%-2%) value or purchasing power of your money. Recently, inflation has been tame. Great, so our purchasing power isn’t being eroded by inflation. But, neither can we expect much return on any checking or savings accounts. It’s likely inflation will pick up in the future and so will interest rates. You can get a similar type of savings account in a brokerage savings or bank savings account. If you are a big investor, then you may prefer the convenience of having your savings account attached to your brokerage account. But you can just as easily link your bank account with your investment brokerage account. So, it doesn’t really matter if you keep savings in a traditional, online, or brokerage savings account. There was an underlying implication to Justin’s question. It seemed as if Justin wondered whether to keep less cash because rates are so low and possibly invest more in the financial markets. The answer to the implied question is “No”. There is no substitute for the liquidity of cash. In addition to savings accounts, the government offers potentially higher yield savings vehicles which are as safe as insured deposits. I bonds interest rates increase with the rate of inflation and Floating rate note’s interest rates rise along with market rates. Both of these cash alternative investments are available at treasurydirect.gov. Be aware that you must hold an I bond one year before redeeming and 45 days for a floating rate note. Certificates of deposit (CD) are another savings alternative for your cash. Just realize that if you need the funds before the CD matures, you will forfeit some interest. Justin, don’t worry about where you keep your savings, whatever is most convenient for you is fine. Try to eek out a bit of extra return in your savings, just don’t sacrifice the safety of your cash. 3. Are Stock Markets Efficient Or Not? Where do you bank? How often do you evaluate your banking institution? We never know what is round the corner so you need an emergency fund just in case. I think 12 months is a bit excessive but then in the UK we still have the skeleton of a welfare state and health service. Having got over the initial fund requrement, the rest should be invested rather than saved. That involves a bit of risk but in the last analysis, depositors in banks and bond holders are not completely guaranteed (as depositors in Cyprus over 100kEUR found last year) so you may as well go for growth. Personally, all emergency funds are kept in the savings account. Full liquidity at the loss of potentially higher interest. But do find a bank that offers a better rate of interest! We bank with what was a local brick-and-mortar bank that has gone through at least two FDIC closures and is now owned by a large mega-bank. As you pointed out, the account is tied to our brokerage account and internet savings account. We have a year’s worth of expenses in 12 5-year CDs that are paying 2%. Their early withdrawal penalty is only 60 days. Excellent advice Barbara, I had a questions which were annoying me but this post has cleared it up. You’re very right about choosing a bank which does not charge for services. I’m currently with Santander 123, while there is a £2 charge per month the rewards i’m getting through cashback and profit more than offsets the subscription charge which means I’m making money after inflation. Great post. @John, I appreciate the caveat regarding living in a welfare state. The important part of holding “emergency savings” is having a cash cushion when bad things happen. Your comment illustrates the amount of liquid cash one needs is individual. @Moneycone-Sounds like a good plan for ready cash (for whatever comes up). @Bryce- You are certainly covered, and 2% interest looks pretty good in this low rate environment. @Nick-Glad I could help. Nice set up with the rewards compensating for the fees! An excellent description about the various savings accounts. My son is fifteen and has his own savings and checking accounts since he started working. My daughter just turned thirteen and I want her to open her own savings account, too. It is a way to prepare them for the future – which comes faster than we all think.